A while back I was away teaching at a Fatherheart School and I was getting close to wrapping up the final sessions when I opened up the class to questions one last time. One of the students (in her early 20s) asked me a question that inspired me to write this week's blog. She said... "If you could give us one piece of advice on how we can live our lives at our age, based on what you have learned, what would it be?" I paused for a moment, and without thinking too much I replied... "If I could turn back the clock and be in my twenties again, I think the thing that would make the biggest difference in my life would be that I would know that I am loved completely and that I am enough". I was surprised at the wave of emotion that swept over me as I said those words and the ripple effects that seemed to wash over all of the students. That started a time of corporate ministry where Papa so gently and lovingly began to love on His little ones with such tenderness. While my advice might have appeared to be common sense and 'Fatherheart 101', just saying those words gave me a perspective on my life that made me realize just how important this was to me. To be loved and accepted has been my life's quest. Of course I have experienced my fair share of love on a horizontal plane, but I have been looking for a vertical affirmation of my life that could only come from the One who created me. Ever since I can remember, I have had an 24/7 internal drive for personal achievement and an unhealthy need to be accepted by others. The combination of these two areas of brokenness in my life have caused me to be surprisingly successful! While others would celebrate my work ethic, my diplomacy, my commitment, my sensitivity, etc.... Deep inside I knew that my motivation was tainted. I was looking for something that I had not yet found. The ever moving target of love and acceptance that I was desperate to experience seemed to be constantly changing. Every time I had it in my sights, the bar seemed to get raised. So I would keep on searching for that place of belonging that I now know is called 'home' (John 14:1-3). Next month will mark the 17th anniversary of when I first discovered what I had been looking for all my life. That is when a man named Jack Winter asked me a simple question... "Can you be a little boy that needs to be loved?" And then he wrapped his arms around me and prayed a simple prayer that turned my understanding of love on its head. After spending my life trying to change so that I could become more lovable, I realized that I was loved completely just the way that my Papa made me. No more, no less. It was at that moment that I finally understood why Jesus died for me. ...To bring me home to His Dad's heart (John 14:6). It was at this homecoming, that I discovered that I was completely and unconditionally loved and accepted by the One who knows all my faults and failures and still loves me just as I am. For the first time in my life, I felt like I was home. While this may sound too good to be true to some folks who might be reading this blog, my friends, this is the true gospel. While I wish that was the end to my striving and people pleasing, unfortunately that has not been the case. As I have continued to grow in my Papa's love for me over the years, some of the insidious self doubts about my value have persisted. Even though my entire life is vested in sharing our Father's love with others, unsettling questions about my self worth still resurface from time to time. Especially when it comes to the public world of itinerant ministry. In a multi-media world where we have an unlimited spiritual buffet of ministries and ministry styles to choose from, it is easy to fall back into the broken world of feeling that I am not enough. Maybe if I was more professional in my presentation... or had more anointing... or if I was more like this person, maybe then I would be enough. 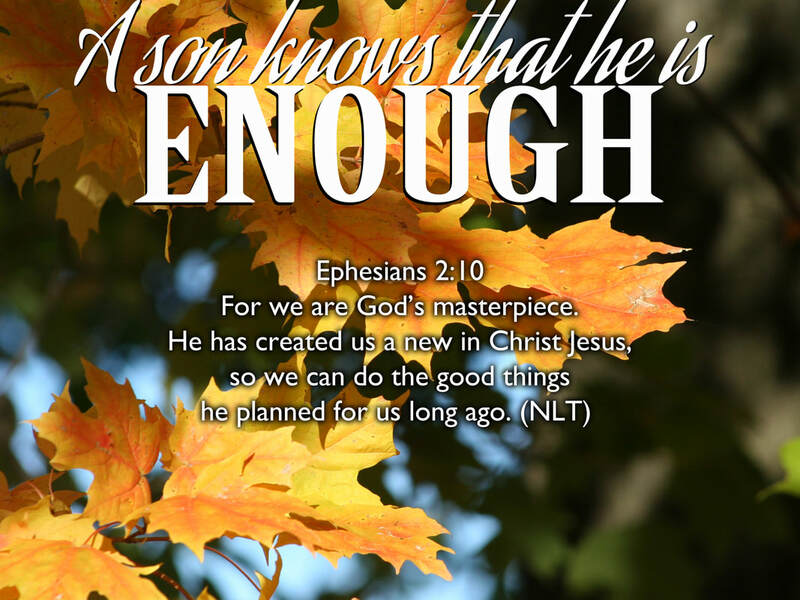 Feeling like we are not enough is a cruel self judgment of our immeasurable value to God and the way He created us to be. It will only lead us into many empty pursuits to find fig leaves to cover our shame. The tireless efforts of jumping through the fickle hoops of people pleasing, isolation, counterfeit affections and unhealthy comparisons are but a few of the ways we will cope with the cavernous emptiness of self hatred. The truth is that God loves what He has created (Psalm 139:13-14) and it is only when we simply agree with His perspective that we will be able to love our neighbors as we love ourselves. 1 John 4:19 says that we love because He first loved us. He loved us when we were His enemies. He loved us when we were powerless. And he loved us when we were in complete darkness. (Romans 5:6-10) He loved us then and He is loving us right now. The reality from heaven's perspective is that we are enough because our Papa says we are! We don't have to overreach because if God is for us, who could possibly be against us? (Romans 8:31) The more that we simply believe this to be true, the less we will try to be anything other than who He created us to be. For it is in just being our authentic selves in Christ that we will be able to shine with all of the glory that He has placed in our clay pots (2 Corinthians 4:6-7). I have said all of this to simply give you some insight into why my answer to this student impacted me so much. All I have ever wanted is to be loved for being who I really am. I think that is all that any of us have ever wanted. I believe that when we begin to see our Father for who He really is, we will see ourselves differently too. Gone will be the religious self loathing that some may wrongly interpret as humility and in its place will be the glorious realization that we are loved and accepted beyond our wildest dreams (Ephesians 3:14-21)... right now. The truth is that you were created for your Papa's pleasure (Revelation 4:11) and He loves the way you reflect His image (Ephesians 5:1). So take a deep breath, relax and sink into the glorious one-of-a-kind reflection of the Godhead that you were created to be. He wants you to be free to be yourself (Galatians 5:1) because in His eyes, you are more than enough!